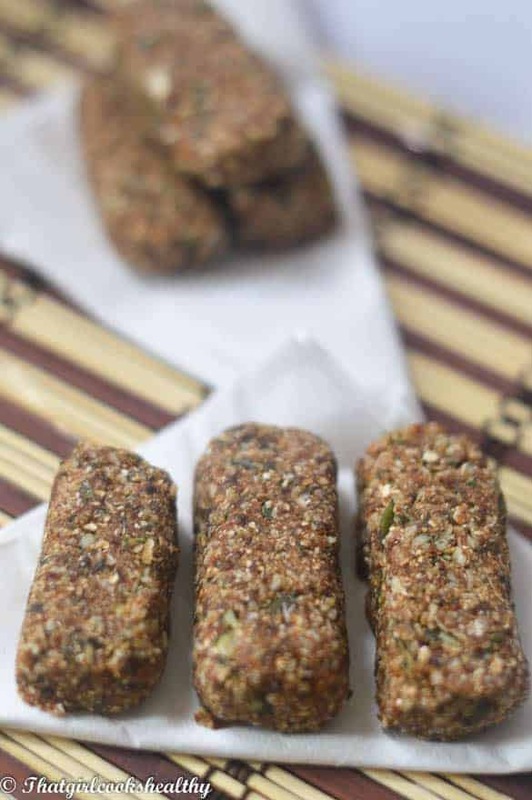 Pumpkin seed energy bars recipe – These gluten free bars are so delicious, made using only 6 ingredients and ready to eat in a matter of minutes. This is my first attempt at making some pumpkin seed energy bars and these were an absolute HIT in my house. I do like to make energy balls as a preference and complacency. However, I was browsing the internet for some ideas and came across a multitude of energy bar recipes. This had inspired me to try my hand at energy bars rather than my go-to-with-ease-and-simplicity energy balls. 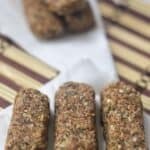 The homemade bars are made with shredded coconut, cinnamon, presoaked dates, himalayan pink salt and oats, I used quick cooks – they are thinner than the steel cuts ones. For my gluten intolerant audience please opt for some gluten free oats (providing these don’t cause an inflammatory response/exasperate symptoms). Pumpkin seeds have a host of nutritional properties; magnesium, zinc, plant based omega-3, promotes a healthy cardiovascular system and not to mention it’s brilliant for prostate and postmenopausal health. This recipe is a nutritional powerhouse not to be reckoned with – you were warned ! The quantity of the recipe makes roughly 5 bars, about 12cm in length if my memory serves me correctly. I used a rolling pin to mould the bars into rectangular shape and placed them in the freezer. I prefer to put them in the freezer as opposed to the fridge because I feel more reassured about their firmness. Using a food processor with a S blade, on high speed process the oats, pumpkin seeds and shredded coconut until a fine meal is formed. Add the cinnamon and pink salt to the mixture. With the food processor still operating on high speed, pour in a few dates at a time. Transfer the contents onto parchment paper and use a rolling pin to roll out the mixture – the bars should be about 2” thick. Once the desired thickness is met, use a knife to cut into rectangles. Put the bars in the freezer for up to 2 hours to firm. My name is Charla and I am passionate foodie who specialises in creating recipes that are not only gluten and dairy free but I also like to tap into my Caribbean heritage making healthy rendition of classic recipes.